The era was easy for us, and discovering a “Fashion Icon” that epitomizes our style…well, that was icing on the cake, and a breath of fresh air! 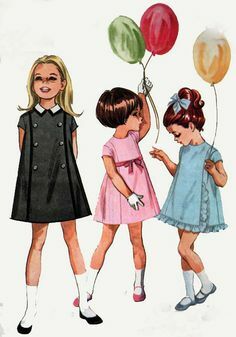 If we were to pick an era of fashion most similar to our tastes, it would be the 1960s, hands down. 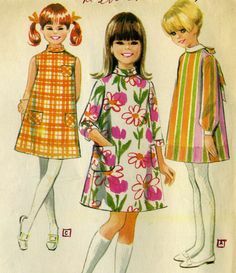 Vintage, 1960s patterns are the look we’re drawn to, more often than not. Meet Twiggy (or be reintroduced to her): After seeing her a-line, above the knee dresses that she was known for, we were hooked! 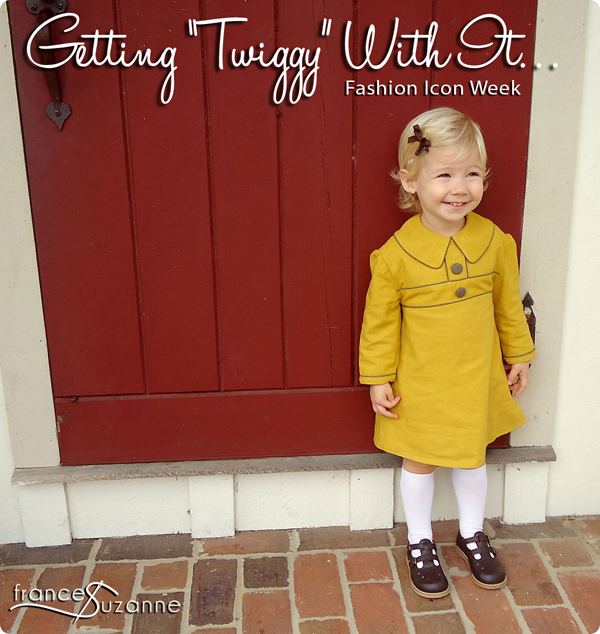 Twiggy’s style would take a basic, a-line dress and mix/match collar styles (high neck, peter pan, or no collar) and different sleeve lengths, depending on the season. Color blocking was used from time to time as well. 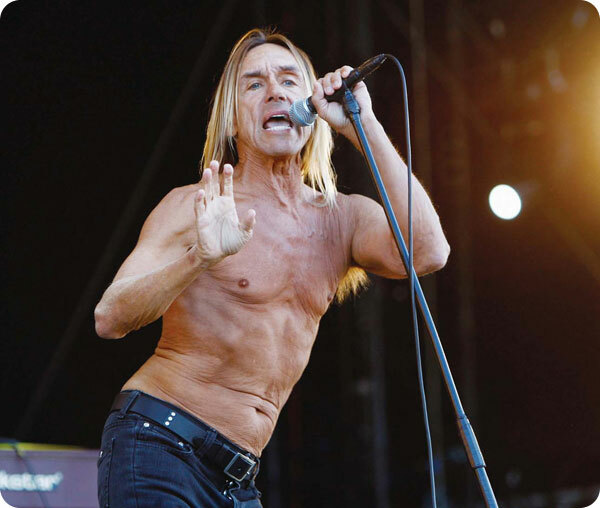 When we told our sister (aka: the nieces’ momma) about “Fashion Icon Week,” she misunderstood our fashion icon to be “Iggy”, as in “Iggy Pop” (?!?!). 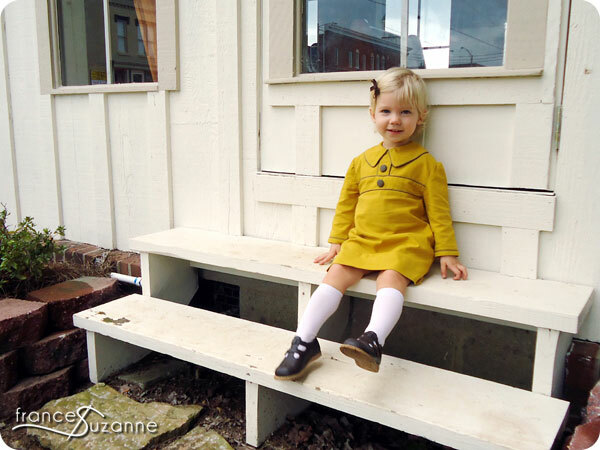 What she visualized us sewing a 2 year old based on good ol’ Iggy is beyond us! Still laughable….and scary…. Our fabric selection, again, was geared toward the 1960s and the fall season that was quickly approaching. 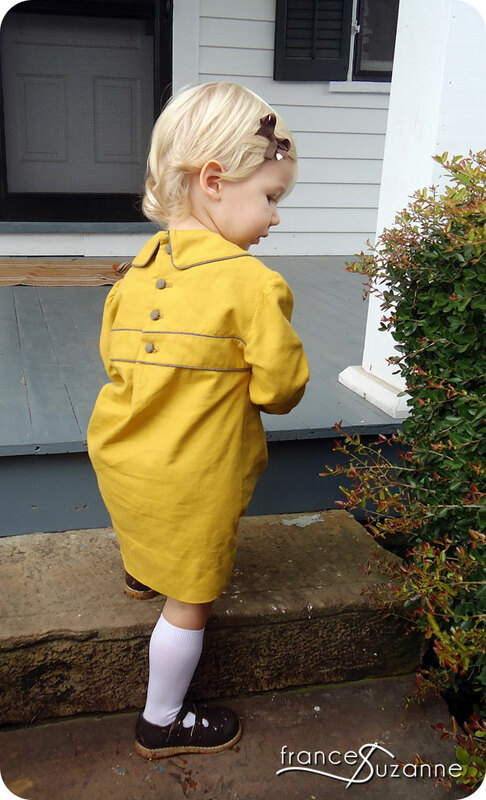 We also chose to make this outfit with long sleeves, in the hope it will last through the fall months. 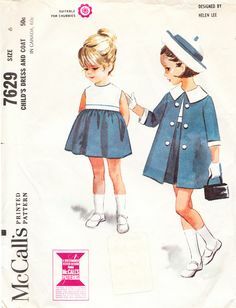 The vintage Butterick 3485 pattern assisted our preliminary plans. 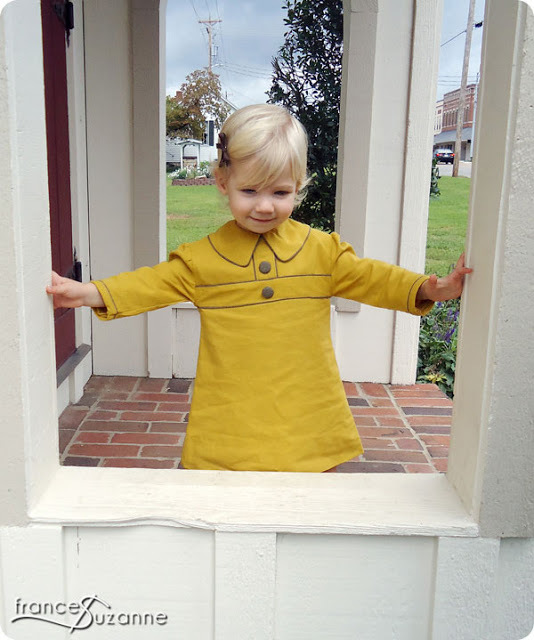 We used the yoke, sleeves, and collar of this pattern. The yoke was modified to include a faux a-line belt, and an additional center tab was added. 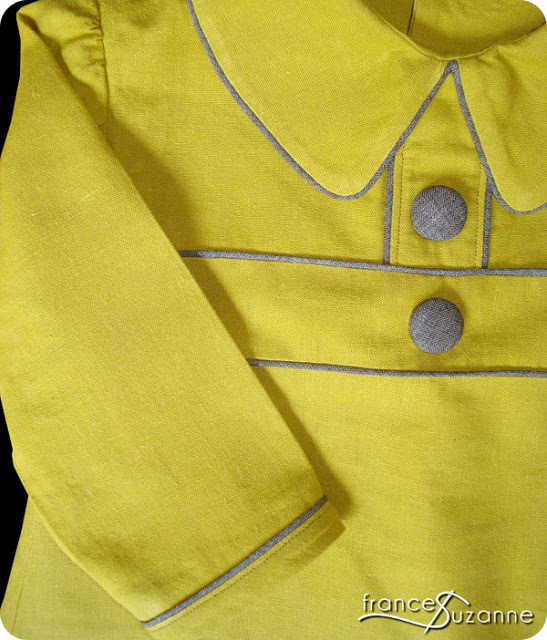 Covered buttons were placed on the center tab (as well as the back closure), drawing attention to the clean lines and piping details of the dress, collar, and sleeves. Afterwards, we attached an a-line skirt underneath the faux belt. While there were so many other components that Twiggy incorporated in her various wardrobe pieces, most outfits were classic and clean with simple lines and details. So, we tried to do just that: keep it simple and classic. 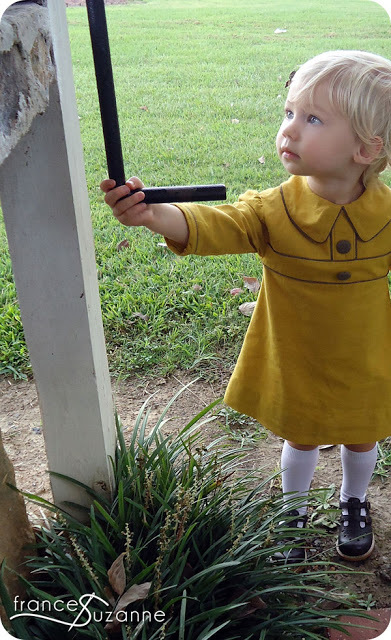 We couldn’t have asked for a better photo session with the niece! She was adorable, cooperative, sweet, etc. etc. In fact, while we were taking the photos, she assisted in ‘choosing’ her own spots for pictures. 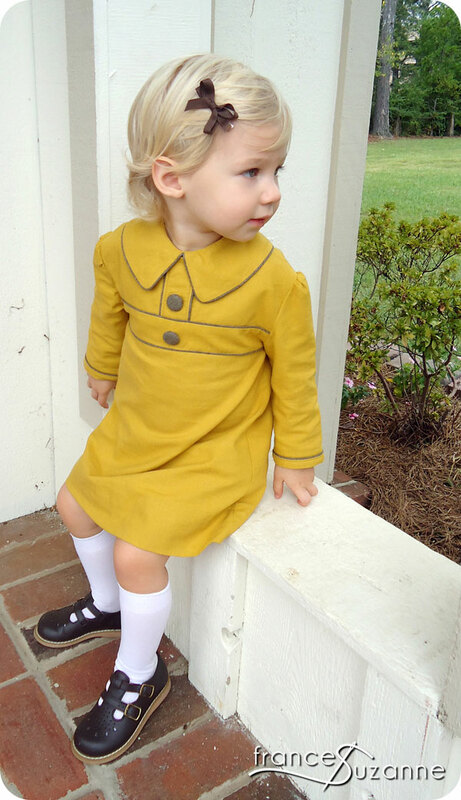 Of course, we had to throw in a little knee sock action…for Twiggy’s sake. Hope you enjoyed our little flashback to the 1960s….we know we did!! This was another challenge that I had absolutely no ideas as to what to do and you all knocked it out of the ball park AGAIN! :) The dress is gorgeous and the styling is perfect! So disappointed we won’t see an entry from you this week. Guess we’ll just live vicariously through you on Boy’s Week!!! 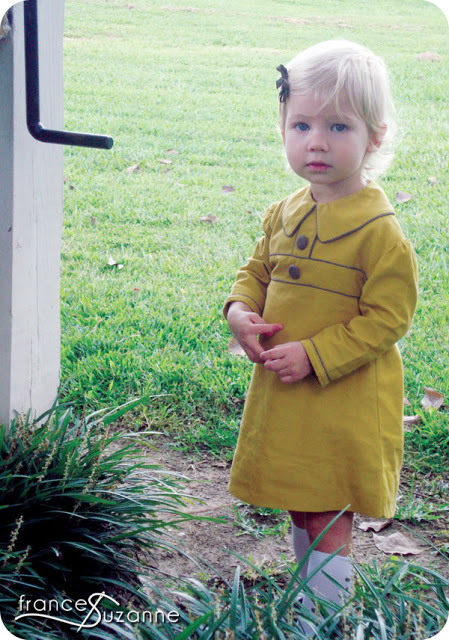 Ahhh, the dresses I made inspired by Twiggy in my misspent youth. You two totally nailed it, especially with the choice of fabric colour. The details and construction are perfection. Once again, nicely done! 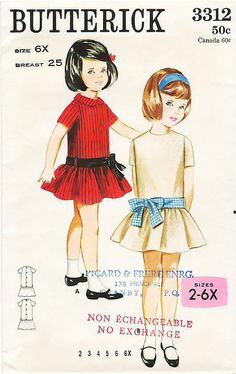 How about you make and sell some patterns of those Twiggy dresses?? I know 2 aunts that would purchase various sizes!! So cute! Everytime I think I’ll sew along, I get stupified and dumbfounded and just plain intimidated by the immense talent! You ladies did a beautiful job. Oh, and I love that mustardy yellow fabric! Dear me…. YOU CAN DO IT!!! Sew along with us…. 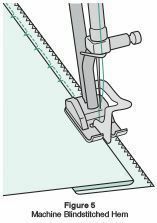 Our next blog post is sure to elevate any sewing prowess you have…. I loved the piping and covered buttons. They provided such a nice finishing touch to a beautiful dress. This is just gorgeous – breathtaking, actually! 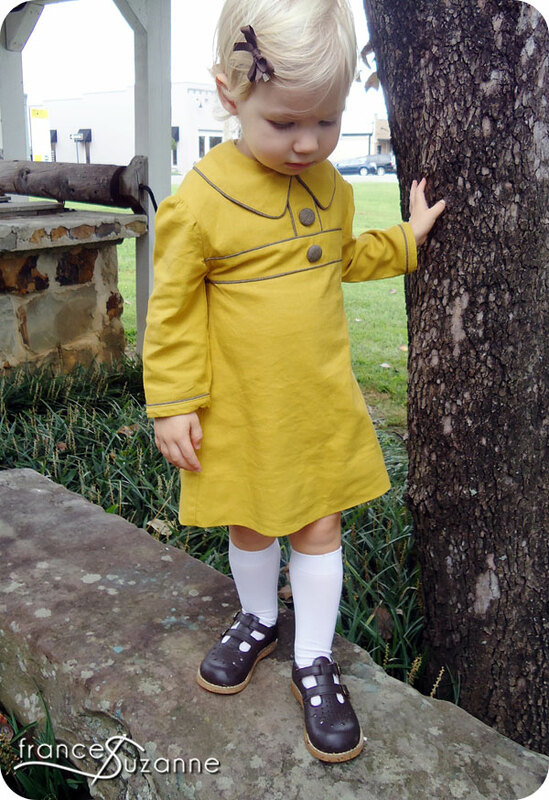 The color with the grey piping and buttons – so perfect! And could you ask for a sweeter model? Wow, thanks!!! What flattery…. We LOVE the items you pin and sew!!! wow, this is so perfect! i just love everything about it! Thrilled you like it!!! 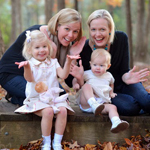 Your blog posts are always an immediate read… Such terrific projects and sewing ideas. So glad you stopped by….. Gotta love shwin and shwin linky parties!!! 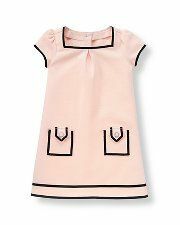 So adorable..both the dress and your daughter!! Beautiful! Love the piping and the pictures. Thanks all for those kind comments. It came at a great time …. it was a trying week in the sewing world. We couldn’t socialize for sewing like mad these past few days!!! How adorable is this?! So cute! Thanks for sharing! I love it. Super adorable! I am so glad I am not a sew-along judge! This dress is absolutely darling! I want one for my girls!! I LOVE it. Nice work! OMG! I came over from Shwin and Shwin and the two of you will bankrupt me in pdf patterns!! Love this, and love the era! I love this dress! You did such a great job! Can I ask what type of fabric did you use and did you make your own piping? If so, how did you do that? I would buy this pattern in a heart beat. Also, where can one purchase white knee high socks. 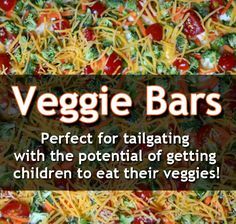 I need some for my toddler daughter as well. All I ever see are stockings. I’m full of questions. Thanks for those kind words! We got the fabric for this dress from Joann’s. 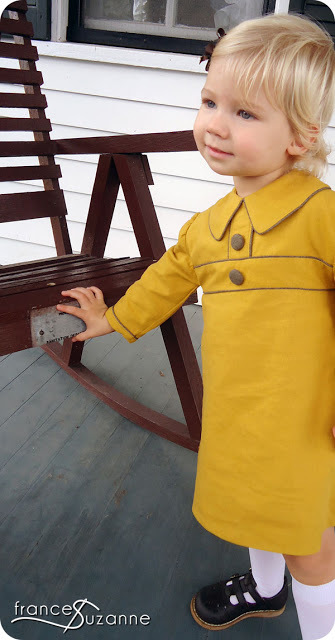 the mustard one was a heavy linen and the brown was a blend with polyester (eek!) in it. I tried to find your email to respond to your sock and piping questions but didn’t have any luck. Short answers: yes, we did the piping and bought the socks from http://www.iftheshoefitsetc.com. 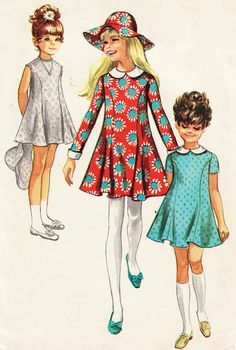 I’d love to attempt to make this dress. 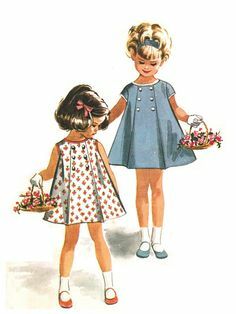 When I searched for Butterick vintage pattern 3485, I came up with something odd, and not like the pretty dress on your daughter… Any suggestions of web links would be greatly appreciated! Thanks for asking! 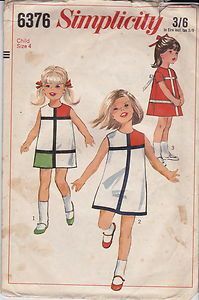 Here’s the link to a size 6 on ebay now http://www.ebay.com/itm/Vintage-1960s-or-1970s-BUTTERICK-3485-Girls-Box-Pleated-Dress-Pattern-UNCUT-/380498459203. 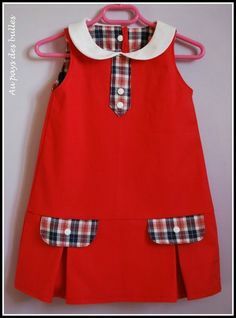 We REALLY adore this pattern and would like to make the dress again without any modifications. Wonderful! 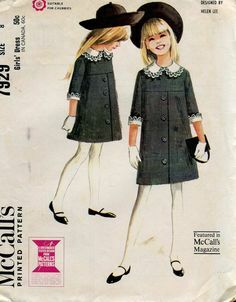 I bought it and will mull over the pattern to see if i can wrangle a Christms dress out of it. Thank you for helping. 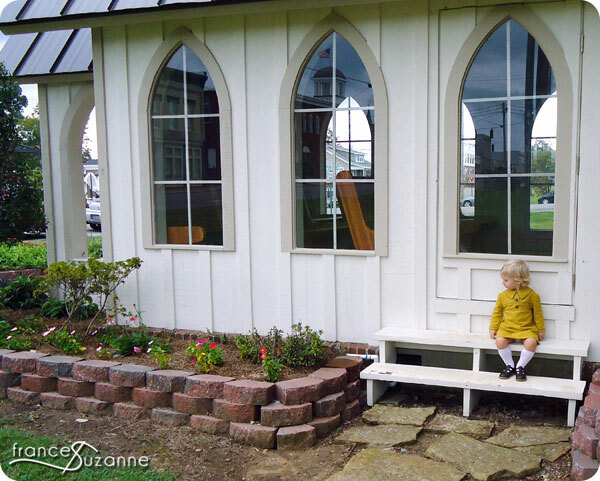 My daughter just shared your blogs with me and I am in awe! This beautiful little girl is the best dressed child in the universe! Honestly, love your STYLE. Piping just sets these off. And the wonderful artistic additions…stitched tree, appliques, flowers, etc. You two are oozing with creativity and class. So glad you found us via your daughter!!! We are having lots of fun sewing for our nieces….too much at time :). That is so lovely! I really adore piping – the way it creates clean lines on clothing. You’ve done a really beautiful sewing job too. Beautifully made!